Wet Staten Island Basement? Waterproof! Vulcan Basement Waterproofing is not a franchise and we do not subcontract any work. When you do business with Vulcan, it’s Vulcan who does the work and gives you a waterproof basement. Professional, reliable, and experienced — We’ve been in business for over 65 years, basement waterproofing in New York, Long Island, Staten Island, New Jersey, Connecticut, Pennsylvania and Delaware. When you are looking for a basement waterproofing contractor in Staten Island you need to be wary of fly-by-night companies. The state of New York does not require a state license for waterproofing contractors. Fortunately, Staten Island does require a New York City license for waterproofing companies, and we’ve been helping local residents for over 60 years. For safety of mind, choose Vulcan Basement Waterproofing in Staten Island for basement waterproofing and crawl space repair. We have successfully waterproofed hundreds of homes in Staten Island and have hundreds of positive reviews and testimonials to back up our work. Need a Staten Island Waterproof Basement? 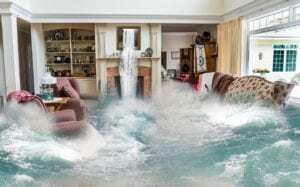 Do you have water in the basement every time it rains hard? You do not need to live with the anxiety of a Staten Island wet basement whenever it rains. Let Vulcan improve the quality of your life and your home by keeping your basement dry. Vulcan Basement Waterproofing offers solutions that will help control leaky basements regardless of how big or small. We offer free customized appraisals, based upon the type of work you may need, whether a patented pressure relief system, French drain, sump pump, or any other below-grade remediation. Any one rainstorm can add enough pressure to force water into the basement. Years of moisture and basement dampness slowly cause structural damage and cause the need for a waterproof basement. Mold and mildew can also cause structural damage over time. Learn how to check for excess moisture or basement water damage. Vulcan gives you a waterproof basement and repairs crawl spaces in literally thousands of homes, including those in Staten Island. Have a waterproof basement with just a call! We employ certified basement waterproofing experts. These experienced experts are armed with proven, patented waterproofing products used to permanently fix your wet basement. We put Quality 1st and have become well known for our focus on customer satisfaction. We don’t consider our job finished until you are so excited about the end result that you are telling all your neighbors. We have become Staten Island’s trusted contractor for basement waterproofing.